Speaking of Trane and finding Trane | Jon Katz, P.C. 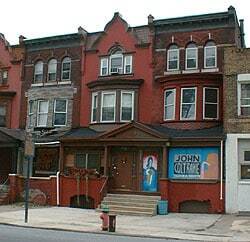 John Coltrane Society, to the right of Trane’s house in Philadelphia, where he lived, composed and played music in the 1950’s after leaving the military. Copyright Jon Katz; taken May 2007. Same place, different photographer. From the National Park Service’s website. In 1995, I spent over four weeks at the Trial Lawyers College with the amazing John Johnson, who was hugging personified. When John Johnson left the planet in early 1996, he hugged me in a dream the same evening I learned of his passing. The next evening, his belief in the power of hugging followed me as I accepted a homeless woman’s requests for a couple of hugs on a snowy evening after I bought her dinner, when before I may not have accepted the hug request of any stranger. It carried into the next day, when for the first time I met my now close friend Trudy Morse when I went to pray for John. She is a hugging friend I met after the passing of another hugging friend. Shortly afterward, I spoke with another Trial Lawyers College participant about how I had gone mainly from being a non-hugger to all this hugging after John Johnson passed; that is not to say that I have gone the opposite route, either. He suggested that all this might have happened because I finally had opened myself to receiving the hugs. So I had. My Trial Lawyers College experience helped me take a much more realistically optimistic approach to my life and growth versus my previously much more bleak and cynical outlook on life that was heavily informed by the daily injustice I saw — and still see — inflicted on criminal defendants and on other people. I write more here about achieving a more harmonized approach to life, not out of embracing any new age concept, but out of necessity. As I opened myself up to a more spiritual (but mostly non-religious) and harmonious life, I started paying more attention to those on a similar path, including jazz legend John Coltrane, whose life was cut short by cancer in 1967 at the age of forty. In this context, was it mere coincidence that last month I happened upon Trane’s Philadelphia home? On the way back from a great re-adventure in Massachusetts and New Hampshire — where, among other things, I visited Jack Kerouac’s childhood town, Lowell, Massachusetts, for the first time — my wife, son and I spent an afternoon in Philadelphia. This time, instead of visiting the usual downtown areas not far from Independence Hall, we varied our route. After visiting the Philadelphia Museum of Art, for the first time, where Rocky made his famous run up the many steps, we drove further north, ultimately arriving at an unexpected jewel. Serendipitously, I had found John Coltrane’s house — pictured above — where he lived, composed and played music in the 1950’s after leaving the military. More details about the house are here. This was late on a Saturday afternoon, when I saw a man leave the Coltrane Cultural Society house, which appeared to be in the process of renovation. The man estimated that the Cultural Society building should be open soon to the public. Trane’s house remains occupied by one or more family members, but I saw none that day. I soaked in the better picture this gave of Trane’s persona, and took some pictures. As I have blogged before, the significance of Trane to my law practice is the inspiration he gives me towards excellence through pouring my heart into what I do. Also, as I have said: In the sterile, windowless, and often chilling surroundings of a courtroom, the imagination is needed to make the place come alive for justice. I like to replace the framed paintings of unsmiling judges and the appearance of armed police with the antics of R. Crumb, the juxtapositions of Joseph Kosuth, and the endless imagination of Santana Miyazaki. I like to replace the unsettling sound of clicking handcuffs and slamming celldoors with the sounds of Dizzy Gillespie’s be-bop, John Coltrane’s Love Supreme, Van Morrison’s “Moondance”, and Cecil Taylor being Cecil Taylor. Finally, love played a big part in Trane’s life, to the point that he entitled one of his greatest masterpieces A Love Supreme. Love is a very big theme at the Trial Lawyers College, too, including the importance of loving our clients, loving our loved ones, and loving ourselves. The concept often got watered down for me at the Trial Lawyers College as many people said “I love you” so often to so many people to the point that the phrase seemed to start losing its significance; on the other hand, universal brotherly and sisterly love certainly will make this world a much better place. It was particularly fitting that the two people I love the most were with me on this adventure. Jon Katz.